The 10 Best Pasta Places in New Mexico! Pasta is so much more than spaghetti and meatballs. 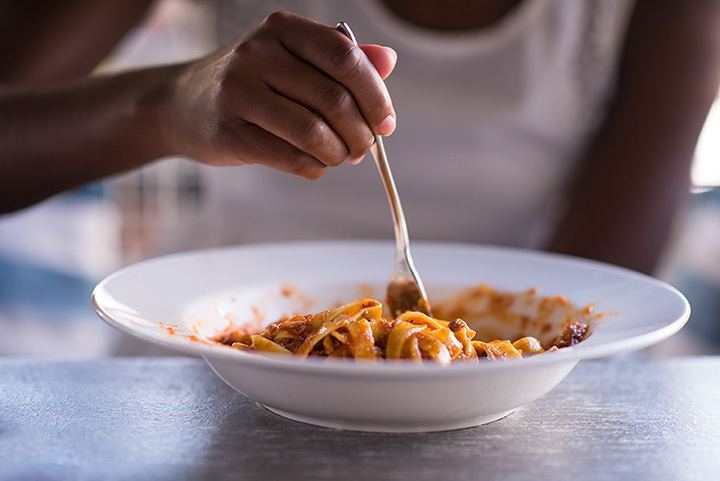 There’s linguine, penne, angel hair, lasagna, ravioli and gnocchi and the marinara, alfredo, and Bolognese sauces that all make Italian dishes so popular. These 10 restaurants in New Mexico are serving up some of the best pasta options around. Dig in! The red checkered tablecloths create a friendly and unpretentious atmosphere at this classic Italian-American restaurant. The homemade fare, billed as distinctly East Coast Italian, is full of bold flavors and fresh, natural ingredients. Menu items like penne ricotta with sausage and peppers or mushroom and ricotta cheese filled ravioli top the list of favorite pasta dishes. Great online menu for take-out. After eating at this restaurant located in the old Deming National Bank building, circa 1884, you’ll find yourself saying, “Now that’s Italian!” From the breaded eggplant appetizer to the ricotta-filled manicotti to the stuffed cannoli, the food embodies the best of Italian favorites. Every meal begins with a basket of bread and oil and garlic for dipping. Don’t miss the pasta bar buffet. In Italian, a mano means handmade. That’s what happens here. House made bread, eight different pastas, flavorful sauces and tantalizing desserts are created daily. The cuisine showcases authentic specialties, seasonally, from different regions of Italy. It’s charming, rustic and a little piece of Italy in the southwest. Recipes straight from this restaurant owner’s Italian grandmother’s kitchen have helped put this eatery in Albuquerque Magazine’s Best of the City category for multiple years running. Traditional pasta dishes include fettuccini carbonara, penne pasta primavera, manicotti Bolognese and baked cannelloni. Southwest flavors are highlighted in the green chile chicken ravioli. A popular lunch buffet, dinner specials and community fundraisers keeps diners coming in. Don’t let the old Pizza Hut building that’s home to this restaurant deter you from eating here. It’s one-of-a-kind. You’ll find bonafide Italian pasta specialties. Fettucine, linguini, angel hair, spaghetti, gnocchi and ravioli come with a variety of sauces and fresh vegetables, meats and cheeses and are cooked-to-order. Spumoni ice cream is a must for dessert. Cooking good pasta is about more than just tossing it in a pot of boiling water, stirring and, after a few minutes, draining. It begins with homemade pasta. Then it’s immersed in a sauce made with fresh, locally sourced ingredients and garnished with care. That’s the type of meal you’ll find at this family-owned restaurant. Pastas like seashell shaped conchiglie, corkscrew fusilli and creste rigate or “groovy moon,” a curved macaroni make this a unique dine-out or dine-in experience. Relaxed, cozy, comfortable. This small restaurant is a gathering place for those looking to enjoy delicious Italian food. Reservations are really a must due to limited seating and a smart move since the food is exceptional. The linguine cioppino is a house specialty, but you can’t go wrong with any of the fettuccini, spaghetti or penne pasta dishes. Sit outside on the patio on a warm afternoon or evening. When the moon hits your eye like a big pizza pie, that’s amore … or Pastaggio’s where everything is made with passion, pride and love. Pasta is imported from Italy and made fresh daily, as is the panini sandwich bread. In a nod to southwestern flavors, local chiles are incorporated into a red or green chile alfredo sauce. Gluten free penne pasta and ravioli available. Take-out anything on the menu. Step inside here to the smells of Italian spices and homemade cooking. There’s an eclectic menu of burgers, burritos and pizza, as well as Italian pasta offerings which are authentic and tasty. Mostaccioli, rigatoni, fettuccini, linguini, rigatoni and, of course, spaghetti come with traditional sauces, and you can add chicken, sausage or meatballs to any of them. Homemade gelato adds some sweetness at the end of the meal. This restaurant’s name translated means “nice evening.” That’s what you’ll have here. You’ll find authentic Italian flavors in a variety of fresh pasta dishes. The Pasta Trio provides a taste of three popular pastas: lasagna, manicotti and canelloni. Lobster ravioli with pink sauce is a delicious surprise. Homemade, fresh baked rolls and butter come with a meal. An international treat in a place you just wouldn’t expect it.